I absolutely love Greek salad. My love affair started in college. I went to Cornell University in Ithaca, New York, a surprising hub for Greek food. The Souvlaki House had a version of this appealing salad that was super yummy and for some reason just tasted better when you ordered it to go. The rectangular foil container contained perfectly crisp iceberg lettuce, chunks of tomato and cucumber, onion, lots of feta, a sprinkling of dried oregano and a super tart vinaigrette. Nirvana - in a to go container. I’ve never found a Greek salad that matches the integrity of the Souvlaki’s House, but I still enjoy this salad especially when I make it at home and can load on as much Feta as I like. I will put Feta in any salad if I have it on hand. The salty, tart creaminess turns any creation into a special treat. I’m a little obsessed. Feta is also really good on pizza and in pasta (just a side thought). This version of my Greek salad is truly loaded and a meal in itself. 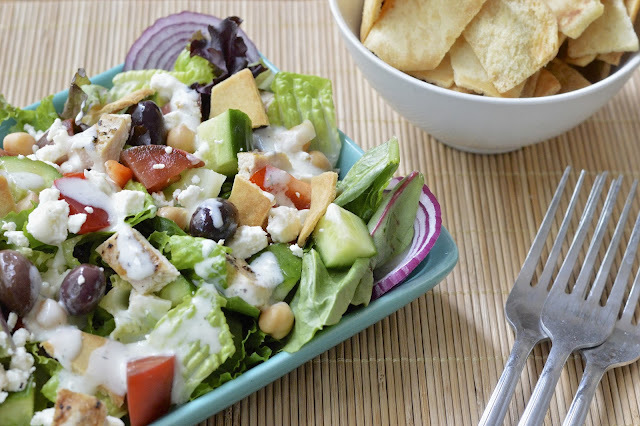 On top of the classic, I’ve added garbanzo beans, grilled chicken and crunchy pita chips (just pretend they are croutons). The tzatziki dressing contains Greek yogurt (of course) and is quite tart. If you are not into a really vinegar heavy dressing cut the vinegar in half. Make dressing - in a small bowl add all dressing ingredients and whisk until smooth and emulsified. Place mixed greens in a large bowl. Top with cucumbers, peppers and tomato. Add feta, olives, chicken, pita chips and onions. Drizzle with dressing to taste and toss.